Made in the Type 97 style, with a dummy safety pin and the remains of the pull cord. The pin was probably removable when new, fixed in place now, probably from corrosion. Completely solid and no doubt used for handling and throwing instruction. I understand that some of these were excavated at the old Japanese Kure Naval Base, around 1998. This is not one of those, but looks the same. Here it is next to its counterpart the Type 97. Physically bigger, probably for a more realistic weight. There are no markings that I have found. Made of some kind of plaster or terra cotta, with a black glaze or painted finish. Not a common item to find and is the only pattern I have seem. Possibly late war issue? 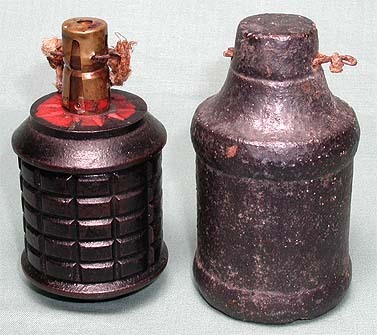 I'm guessing real grenade bodies were usually used for practice, then they switched to this type to save iron. 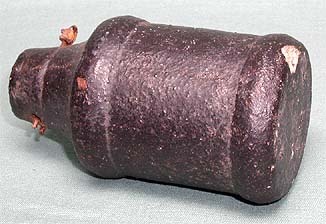 Anyone know if this grenade has a specific designation (Type? ).